Combining Mantra and Mudra to clear blockages in life and in communication. You can do this meditation for 3, 7, or 11 minutes. 11 is best but do whichever you can commit to for 40 days straight. The mantra is to be chanted while sitting comfortably in easy pose with eyes closed and focused at the third eye point. Having both of your hands with pinky and thumb touching and the three middle fingers upright. Hands are to be placed at shoulders with elbows bent by the rib cage. Every time you say “such” thrust your stomach inward. Remover of Obstacles POWERFUL 11 Minute Mediation -JOIN US on YOUTUBE! Link to Dropbox of music that goes with it. 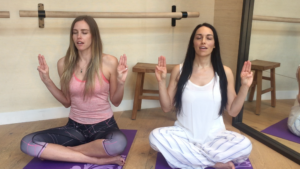 What will this Mantra & Mudra Combo do for you? I swear it’s been magical since I started…I have opened up a writer’s block and I didn’t even know I was a writer! I have had even more energy! I have been able to stop sabotaging myself in terms of food and lifestyle patterns. So much good is just flowing out of me..I jenuinely feel that I am a bubble of light that is unabated and living confidently authentic with grace and love with every breath I take, every move I make, and every thought that comes. No matter what others say or do to me I am able to filter it through my bubble and and have the outcome for the greatest good shine through. I’m on day 6 and I am experiencing breakthroughs in so many areas…I haven’t had coffee, or sugar (which I was addicted to), and have been able to do a cleanse easily with no cravings for junk food since I started this meditation to remove blocks. I’m noticing that I’m valuing myself even more, and am being a light for others and supporting them through being vulnerable and opening up! This meditation is fo real! Haha! Baba Siri Chand was the eldest son of Guru Nanak (the first Guru of the Sikhs). He was a very detached yogi and lived for one hundred and fifty years. He did nothing but good. We have this mantra of his and if you use it, anything which is stopped in your life, it shall flow. There is no power like it on Earth. In some circumstances, I have seen it make the impossible possible very fast. All that is stopped shall move. This technique was taught to help us when we don’t know how to communicate something that is bothering us. It works equally well when we are trying to communicate some creative work and we are blocked. “Your entire sense of communication shall come on your command. For that, you don’t have to have initiation, you don’t have to belong to anybody, and you will carry the day. It is a reality that when your ego (thumb) will press on the Mercury finger, it is just telling the horse, ‘Baby, let us gallop.”‘Your entire sense of communication shall come on your command. Please let me know if you have any questions! 🙂 ENJOY!!!!! PLEASE let me know what UNBLOCKS in your life!